So, we went into yesterday knowing that sports was going to be on the front page. Last weekend, there were two highly emotional NCAA tournament hockey games. After winning an overtime game against North Dakota on Saturday, the 'Cats fell to Boston University on Sunday by way of a power play goal with only 14 seconds remaining. Our sports photographer, Michael Ralph, got dozens of great photos from this weekend, and it was tough to pick just one for the front page. Ultimately, we decided to go with the photo from the last goal in the BU game, because of it's timeliness and composition (puck is clearly in the net, two players are prone on the ice, one is obviously distraught, the ref who made the critical penalty call just seconds earlier is pictured). To make the mesh happen, I created three layers in PhotoShop. First, was the untouched base picture (above). Then, I copied the flag from our InDesign template sized it to the photo. I had decided where I wanted to crop, placing the photo behind the flag in InDesign. I also deleted the background in the upper left corner of the photo so that the date and edition number would be visible. Then I duplicated the original layer, and put it on top of everything. Next, I took the eraser tool and went wild. There wasn't really a need to be careful, since if I erased something on the top, it just revealed the things that were right below it. The tricky part was erasing the bits so the "Serving UNH" line appeared to go behind the goalie the ref and the goal, but behind Blake Kessel (the defenseman in the back.) To do that, I used the magnetic lasso tool with the frequency jacked up to 100. Here's the top layer showing the parts I erased. I added a green background to make things stand out a little more. And here's the finished photo with all of the layers displayed. There was some trepidation about having the blue flag right up against the blue sing along the boards, so I added white lines in InDesign to give it some definition. 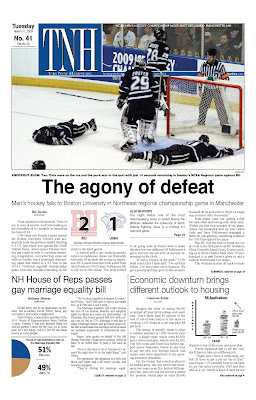 I also added the kicker "NCAA Men's Hockey Championship Northeast Regional Manchester, NH" to the top right corner. Unfortunately, the press must not have seen it because it the reverse text failed to print in the hard copy edition. OK, so now we have the picture and the flag, but we still need the headline, and something to indicate the score. Originally, I wanted the whole thing to be inside the picture frame, and thought there might have been enough dead space to use it. I was also set on using the headline "The agony of defeat". Cliche? Probably. But sometimes that's ok in headlines. Plus we had the news deck (bumped up a few points) to relay what actually happened in the game. I also wanted the hed to play big. Not quite Doomsday, but close. Definitely big enough to see from across the room. Everyone seemed initially happy with it, but there was something about it I couldn't shake. I definitely didn't like how the text partially covered Foster and Kapstad, as well as that lone stick out near the board. The score bubbles (resurrected from some pages I did last spring) looked lost up top. Also, the news deck was just too small, and we couldn't really make it bigger because I wanted everything to be on the top half. I tried with a couple different variations on this - stacking the score bubbles, shrinking the headline, putting the headline up above Foster's head - but none of it was working for me. This is the end result, and what you saw in the paper. In the hard copy, the picture and the headline fit perfectly above the fold, which is always something I worry about when going with this method. In hindsight, I probably should have cropped more of the picture off on the left, to get rid of the dead space where the ice is and include more of Pollastrone's stick and the back of the net. O well, as I said, live and learn and do it right the next time. I should say that none of this could have been done without the talents of Mike Ralph and Biz Jacobs, who produced the things that are most important about the newspaper, the photos and the stories. One last extra tidbit for those of you that read this far. As I said, I was a little worried about the blue flag on the boards in the photos, so at one point I came up with an alternate flag that I ended up liking even less.